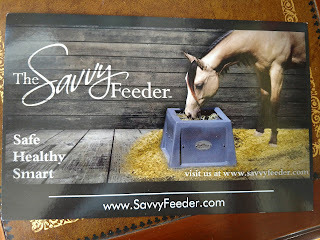 In yesterday's post, I laid out my reasons for choosing a hard sided slow feeder over a haynet in my quest to ensure Connor has hay in front of him for longer, and the various other products I considered before settling on the Savvy Feeder. In today's post, I'm covering how it's actually worked out in real life. We've had it for two weeks at this point. 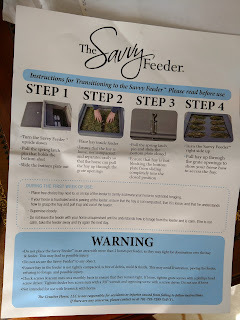 I ordered the Savvy Feeder on a Saturday night, and I have to say, the company was AMAZING to work with in terms of customer service. The scratch 'n dent model I originally ordered was going to come with a grate with holes too big for Connor's grass/alfalfa mix. 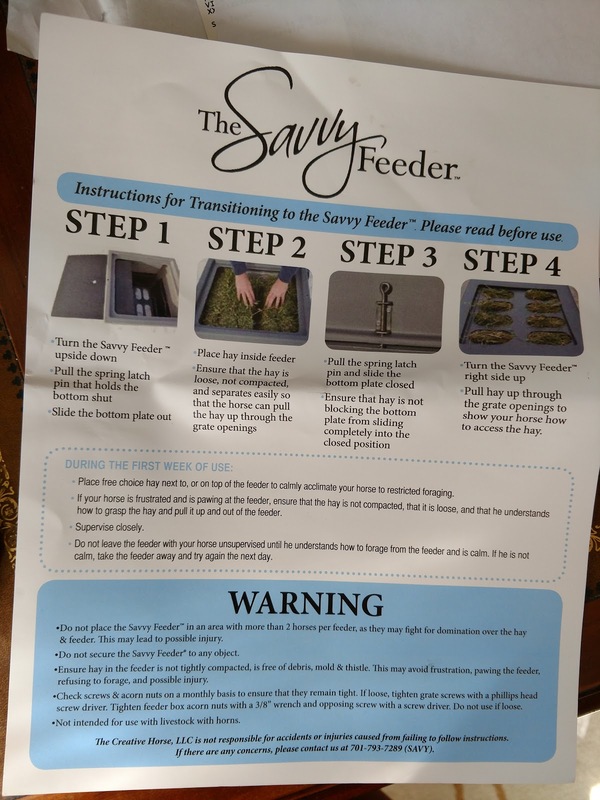 They reached out to make sure I was aware of what grate size it came with, to ask what type of hay I was using, and went WAY out of their way to make sure I wasn't getting the wrong product. We probably exchanged over 20 emails after I ordered and before it shipped. It shipped out Tuesday from Iowa, and arrived Wednesday. 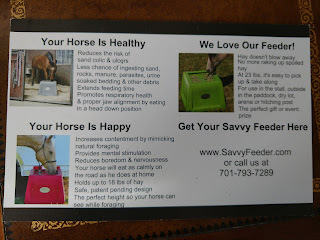 It comes with instructions on how to introduce your horse to the feeder. They err on the side of assuming the horse might be frustrated with the feeder. I found loading it to be super easy, and my trainer and our barn workers agree. 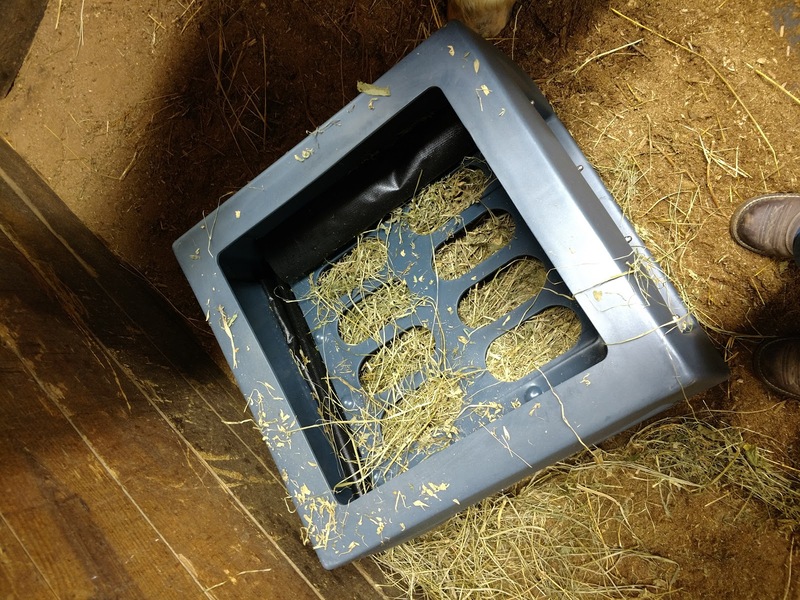 As shown in the images above and below, you flip it over, pull the springloaded pin that secures the bottom, slide the bottom over, drop the hay in, and replace the bottom and pin. 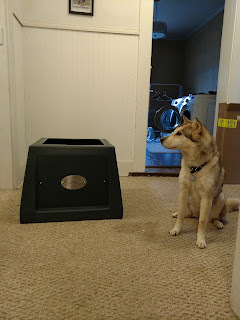 The feeder is big and sturdy, but light enough that it wasn't hard for me to carry it around. I can definitely see taking it to shows without issue. From top to bottom: bottom shown with cover slid out, top shown filled with hay, and the springloaded pin on the side that keeps the bottom in place. The grate is secured to the sides with "heavy black fabric" (vinyl? ), which allows the grate to move up and down as the amount of hay in the feeder changes. The grates are replaceable and come in 3 sizes. The size shown here is the medium size, which is recommended for "most grass and grass alfalfa mix hay. Not for very thick or coarse hay such as first cutting alfalfa or peanut hay," and also for introducing horses to the feeder. Small is for soft/fine grass hays like Bermuda, medium (shown) is for most grass/grass alfalfa mixes, and large is for stemmy alfalfa, peanut hay and old horses that have a tough time grabbing hay. Connor took to it immediately. I knew he would, and I was pretty lazy about introducing it to him. 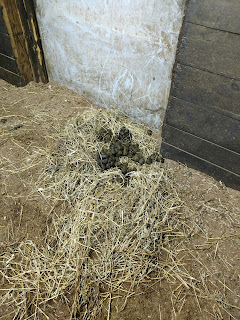 I put hay in there, pulled some through the holes, and sat on a stool in his stall for a half hour, watching him munch hay and listening to the rain on the barn roof. I gave it to him on Valentine's Day, and texted JenJ "Roses are red, violets are blue, I made your dinner harder to eat, haha poor you." I've been happy with it so far. 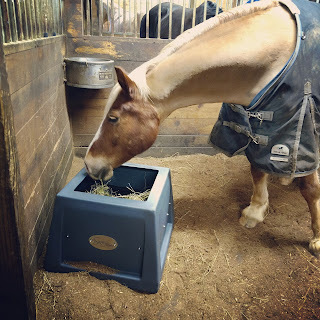 It's no small hole hay net, but it definitely takes him longer to get a bite out than free-choice does (video below). I may get the small grate at some point to experiment with slowing him down even further. I haven't timed it, but he's taking longer to finish his hay in general now. He's also wasting far less hay than before. The biggest downside is that it is specifically designed not to be secured to the wall, which means at first Connor's stall was a disaster as he pushed it around to see if that would get the hay out easier. His stall has gotten better with time as he gets better at eating out of it and has stopped pushing it around so much. Bottom line: This is totally my pick for a slow feeder haynet alternative. I don't feel like I compromised on anything with this one, and it's doing exactly what I hoped it would do. 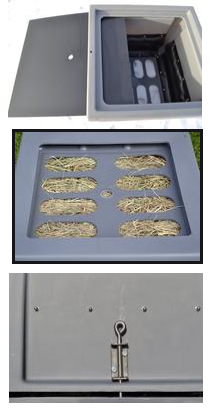 I personally feel like it's the best on the market unless you need to soak your hay inside the feeder, in which case you should consider something like the PortaGrazer. Price: $299 (new), $274 (factory seconds). They regularly offer 10%-14% off coupons around holidays with a maximum coupon of 20% off on Black Friday. Colors: Dark grey, light grey and tan are standard, but they have occasionally had limited runs of other colors, such as red, lime green and teal. What, you didn't lead with "this comes in teal"?!? 😂 Super cool, I'm glad it's working out so well for you and Connor! Right?! Lol. I guess making different colors is really really hard for some reason so they don't do it often? Thank you for reviewing this! 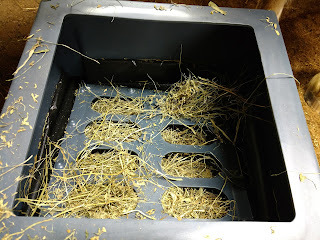 I have been thinking about using a feeder for my older mare in her paddock and I haven't been crazy about the types that have a metal grate on top. Does it have drainage holes in the bottom?? That's really tempting! 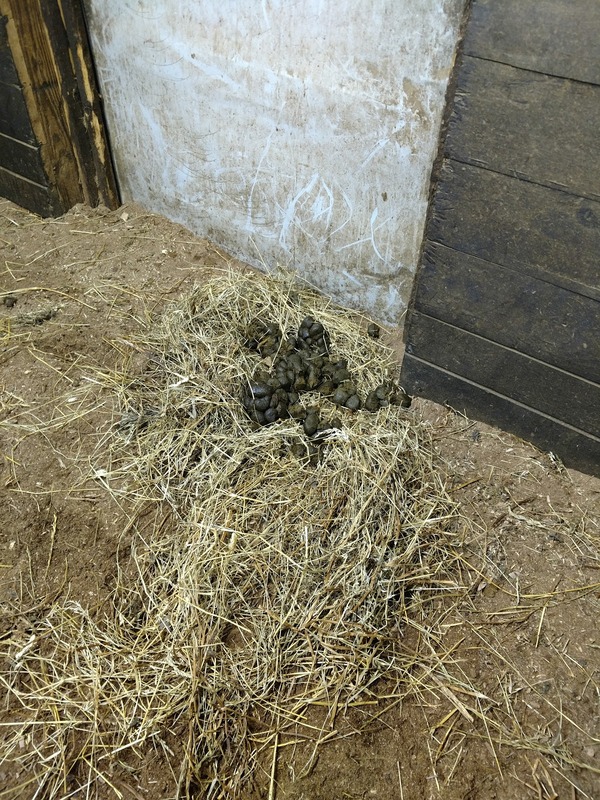 I don't mind Truby's slow feed haynet in her stall, but there's not a good solution to feeding hay outside. Nets and buckets tend to end up with scraps all over the sand. Pretty pricey, but a sand colic would be pricier! 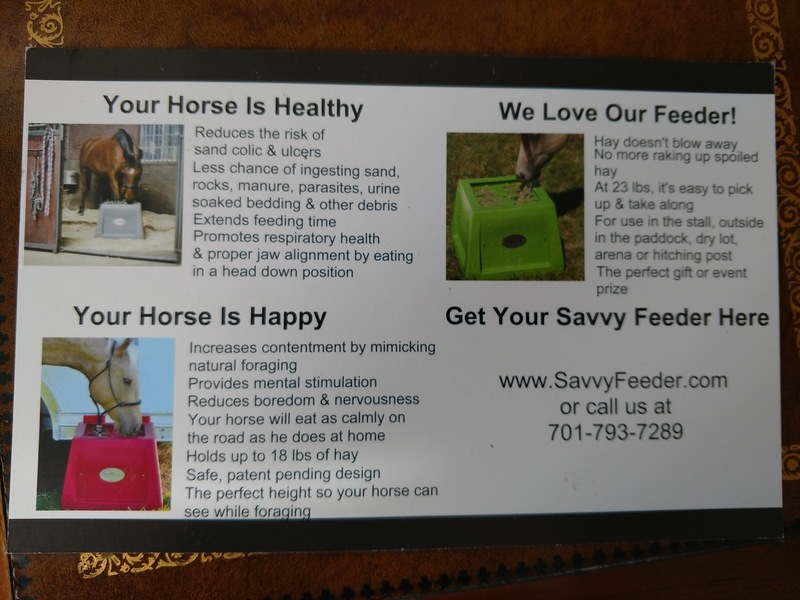 That's what the manufacturer says too, it saves you on hay waste and sand colic! Would you be at all concerned that a horse would get its foot in the feeder, especially since it's light enough to move? Tris paws quite a lot so this is something I think about whenever I see a feeder in this style. You've seen Connor standing in water troughs before so you know he's like that too, lol. 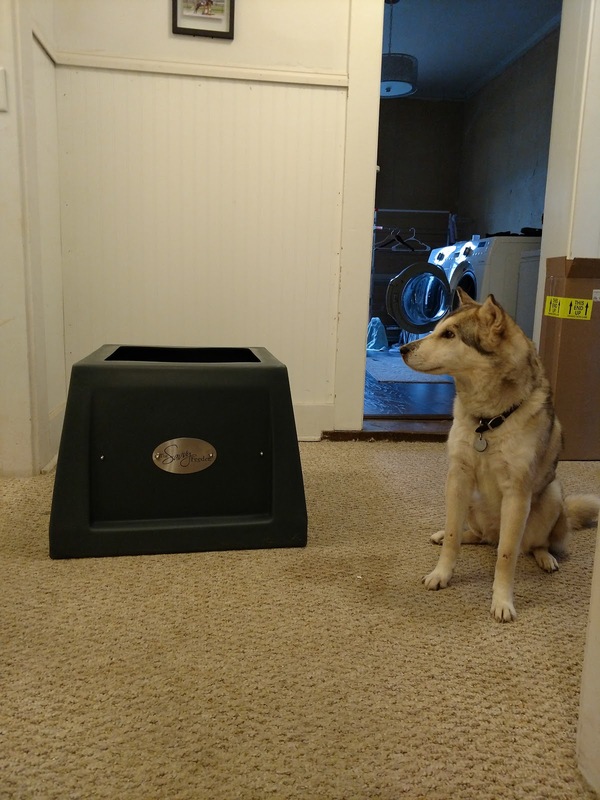 Of course he could get a foot in it, but he doesn't seem particularly motivated to do so, and even if he did, there's nothing for him to hurt himself on in it. This is very cool! I don't have a big problem with my horses wasting hay- no one really poops on it or tramples it- but I would love to slow them down. It does seem to be really good for that. I'll be curious to see what happens if/when I decide to try the small grate. Definitely a neat option. Wish they were not so pricey. Then again they would be muddy from being pushed around by the Cobs. They are definitely pricey, though about the same price as the PG. I think you'd be surprised how hard it would be for them to move in mud - he's only able to move it indoors because he's on mats with a small amount of shavings. Really neat idea! Might be something I consider for shows so that it takes Hampton longer to eat his hay. That way he isn't hungry over night. You can check mine out this season, I plan on bringing it with me. It does seem like a great option for shows. It is news to me that these have ever/can ever come in teal, and now I need one. Glad it is working out for Connor! Haha. I haven't seen a photo of teal I don't think but they talked about it on their Facebook page. Why do I feel like one of these is in my future? TIA for doing the legwork lol.